The National Golf Club is 54-hole golf club, made up of the Old Course and the Ocean Course and the Moonah Course. The Old Course is on a hill near the ocean some 100 meters (300 ft.) above sea level. Each hole is completely separated by matures trees, which is different from the other 2 links courses. The course is quite challenging. You need to hit the ball straight as errant shots are severely punished. Furthermore, the tees are arranged so that the longer the hole, the higher the tee and the greater exposure to the wind. The fairways are weaving and the greens are highly undulated. Even though you hit the greens in regulation if your balls are far from the pins, you have a big risk of 3 putts. The course consists of a number of holes with ocean views, a number of “inland holes”. You can enjoy spectacular coastal views. A long and straight par 4. The longer the shot is, the narrower the landing area becomes as it is squeezed by trees on both sides and 2 bunkers on the right. If you hit these bunkers 250-270 yards off the tee, you can’t hit the green on the next shot. The green is highly elevated and double-tiered. A large bunker at the front left of the green is some 8 meters (30 ft.) deep and should be avoided. A dogleg to the left. The tee shot is over a deep ravine. The best route is to drive over a semi blind bunker on the left of the fairway, which requires a carry of 250 yards. The second shot is uphill. The green is large and double-tiered with a big slope. A downhill par 3 over a lake. The front of the green borders the water, so judgment of distance is especially important. The green is wide and protected by bunkers on both sides. This is the only hole where water comes into play. A signature hole over a ravine with thick vegetation. This hole has breathtaking beauty. The right club selection is critical as the green is around 80 yards wide but not deep. A bunker at the rear comes into play. The tee shot must carry the ravine and land softly on the green. There is only 1 place to hit the ball…and that is on the green. The backdrop of this hole is the magnificent coastline. This hole was selected as one of the best 500 holes in the world by US Golf Magazine in 2000. A slight dogleg to the left with a sharp downhill first followed by an uphill. Although the tee shot is blind, you can enjoy a very long drive thanks to a helpful down slope. A long hitter can reach the green in 2 but a large and deep bunker protecting the front of the green comes into play. The second shot is played directly to an elevated green or to the lower tier of the fairway below the green or to the fairway right of the green, depending on players’ distance and ability. An “S” shaped par 5 with a dogleg to the left first followed by a dogleg to the right. From the tee the choice is to play safely to the right side or to make a short cut by hitting over two large bunkers on the left of the fairway which needs a 230 yards carry. Two fairway bunkers on the right come into play on the second shot. The green is protected by deep bunkers on both sides, so an accurate approach shot is required. A slight dogleg to the right with a blind tee shot. The second shot is gently downhill. A long drive can take advantage and use a wedge to the green. If it is a medium drive, it will be a demanding second shot from a downhill lie to the heavily bunkered green with a 7 iron or so. The green is slightly elevated and triple-tiered with a concave center. A gentle downhill, dogleg to the left. You need a carry of 270 yards to clear a series of bunkers on the left corner, so it is safe to drive to a wide fairway on the right. The second shot must be accurate to avoid not only pine trees left and right of the green but also bunkers around the green which is linked with the 10th green. A dogleg to the right. The tee shot is downhill and a drive short of the dogleg corner leaves a blind second shot to a green. The green is double-tiered from right to left with a 2 meter (6 ft.) drop and if you hit the green on the level different from the pin’s, the next putt will be very difficult. A sharp dogleg to the left followed by a slight dogleg to the right. The tee drops toward the ocean. A long hitter can reach the green in 2 but a precise carry of 260 yards from the elevated tee to clear bunkers on the left corner is needed to set up a possible second shot to the green. Alternatively, you can drive safely to the left of the bunkers. Then, the second shot is downhill and a large bunker 100 yards short of the green will limit the landing area of the shot. The green is split by a central spine and requires an accurate approach shot. You can enjoy spectacular ocean views on this hole. It takes 1 hour and 40 minutes from Melbourne City and 2 hours from the airport by car. You need to be accompanied by a member but opportunities exist for interstate and overseas golfers if they bring letters of recommendation from their own golf clubs. Yardage sticks are in meters. Anyone can play from back tees. 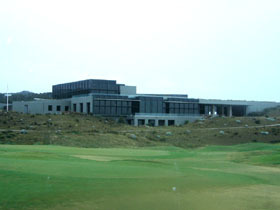 The course was ranked 14th in Australia by Golf Digest 2006. The other Robert Trent Jones Jr.’ designed courses in Australia are Joondalup Resort CC (The 20th of the above ranking), Hyatt Regency Column GC (31st), Meadow Springs G&CC (52th) and Cape Schanck Resort (81th). There is Golf Harbour CC in New Zealand.